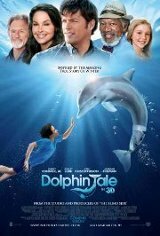 Based on true events 'Dolphin Tale' is a family film about Winter, a young dolphin who loses her tail in a crab trap and Sawyer, the introverted, 11-year old boy who befriends her. Sawyer meets the rescued dolphin at the Clearwater Marine Aquarium, a marine rehabilitation center where she lives. Sawyer rallies friends and family alike to save Winter by convincing a pioneering doctor to create a unique prosthetic attachment to restore the dolphin's ability to swim. Winter the dolphin plays herself in the movie.